Newborn babies are just adorable. If you are looking to give something other than a teddybear, we have the perfect gift to celebrate the new baby's arrival. 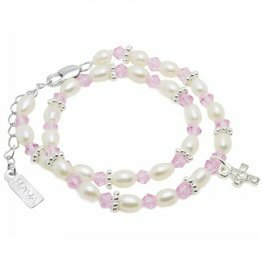 Surprise the new Mum with a cute baby bracelet made of real shiny pearls and gems. Our baby bracelets are xxtra strong (!) using professional wire with nylon coating, perfect for children's jewellery. 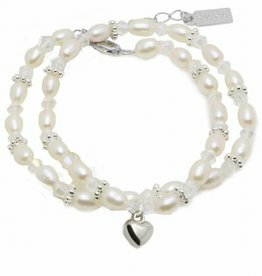 Double Girls Double Bracelet 'Infinity white' with a hart charm - very cute! 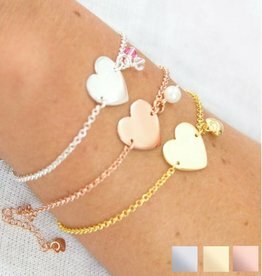 Double Girls Double Bracelet 'Infinity Pink' with a puffed up Heart Charm - very cute! Trendy silver bracelet for child, extra strong! .925 sterling silver bracelet with 2 engraving charms & pearls. 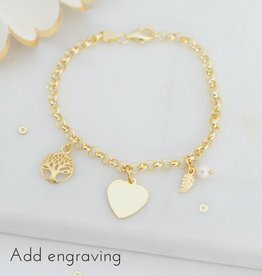 Gold plated bracelet with engrave disc & tree of life. The baby years are so precious and fly by so quickly. 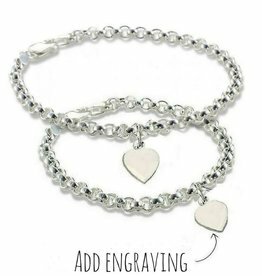 Imagine how beautiful your baby will be when she is all grown up and still has her baby bracelet as a keepsake. You can reminisce together and marvel at how small she was when she wore her baby bracelet. KAYA’s jewellery is all handmade with the best materials like freshwater pearls and Swarovski crystals. Our baby jewellery is appreciated as a gift for a newborn baby as well as for a baptism or christening ceremony. 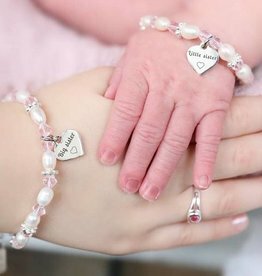 Just imagine how adorable your baby girl will look when her cute little wrist is hugged by a white pearl bracelet for her first photo shoot or her first birthday. Personalized gifts are always treasured most. 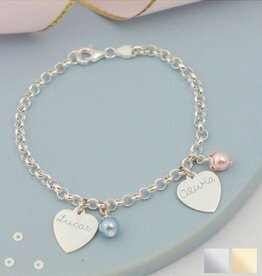 The engraved baby name bracelets are especially beautiful, you cannot go wrong with this baby present. 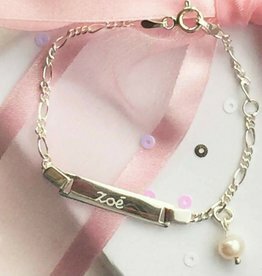 Make your little princess feel truly special with one of the silver freshwater cultured pearl bracelets and add a personalized charm to mark a significant date or engrave her name. 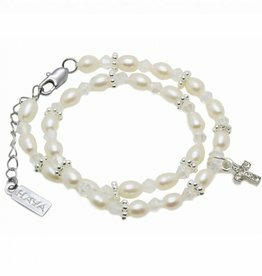 The pretty bracelets features a row of fresh water cultured pearls with a snowy-white finish, enhanced further by a charm with a glistening, polished finish. 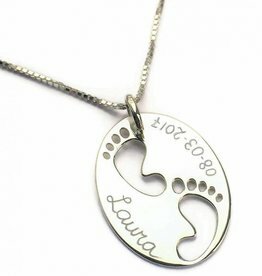 KAYA also makes special Birth Jewellery for Mum and her newborn baby, this is a collection of baby jewellery that comes with matching jewellery for mum. 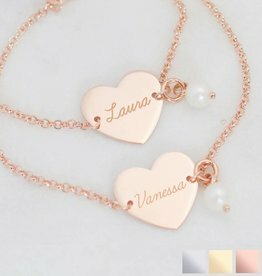 So you and your girl can wear the same pearl bracelet, how sweet and memorable is that! 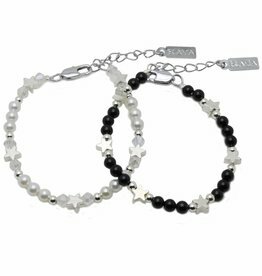 We added the option of an extra sister bracelets to the menu, for those who have more than one little princess in the house. We know that baby’s things should be strong, so we use steel thread with nylon coating for our baby bracelets. 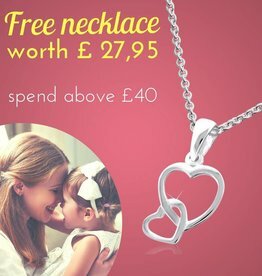 Our baby jewellery is made of genuine freshwater pearls, rose quarts, as well as silver and crystals. All of these materials are very safe for babies to wear. 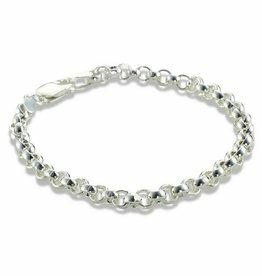 We attach a strong extension chain to the bracelets to make sure your baby can enjoy wearing her jewellery for a few years longer.